Warm, Wet, and Windy - Hi, friend Climate and Weather Information, in this article entitled Warm, Wet, and Windy, we have prepared this article well and concise to be easy to understand for you to read and can be taken inside information. hopefully the contents of the post that we write this you can understand and useful. okay, happy reading. Why do they often together? After the very brief snow early in the week, we have switched into a period of extraordinary warmth and precipitation, with resulting flooding, slope failures, and production of Cascade concrete in the mountains. Last night the temperatures only fell into the middle 40s and temps today got into the 50s, even under considerable cloudiness. Twenty degrees warmer than earlier this week. You can really see the stream of subtropical moisture. And here is the predicted water vapor distribution at 4 PM. The purples shows the air with the highest water vapor content. Nice current of moist air moving our way. Lets take a look at the predicted pressure and lower atmosphere temperature pattern at 4 PM (see first picture below) and the wind speeds aloft (near jet stream level) at roughly the same time (second image below). You can see that the jet stream is closely aligned with the moisture plume above (the moisture plume is roughly parallel to the jet stream but displaced a bit to the south). Looking at the sea level pressures, note the next Pacific disturbance, following the jet stream to the NE. See all those lines of constant pressure to the south of the low--that tells us there are strong winds. As each of these lows have passed north of us the winds increass substantially over the region...like yesterday when winds hit 30-50 mph over western Washington. This pattern is ideal for heavy rain over our region. Warm air can hold a great deal of water vapor. Strong winds push a lot of water vapor towards us and up our mountains where the vapor condenses into rain. Warmth means high freezing level, which helps flooding (falling snow doesn't run off). Precipitation has been well above normal the past few months and these recent events are saturating the soils further...here is the precipitation at Sea-Tac for the past 12 weeks--we are a good 9 inches above normal and there has been a major uptick during the past few days. 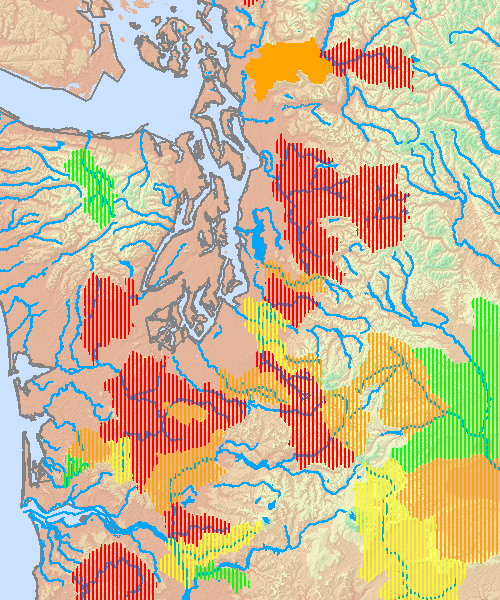 The weather service is warning of flooding on a number of local river systems (see map below) and we are starting to see increasing number of slope failures (e.g., mudslides). 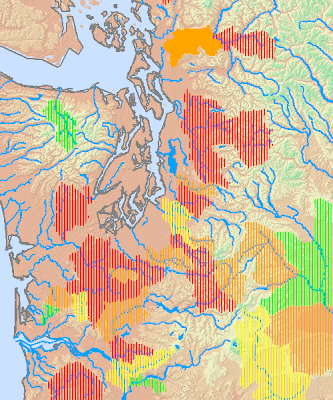 Red indicates predicted flooding. Yellow is bankfull. There is an interesting angle about this regarding global warming. Most of our extreme precipitation events and serious flooding event are associated with atmospheric rivers like the above. Virtually all of these atmospheric rivers are connected with the jet stream (as shown above). Nearly all climate models indicate the jet stream will move north due to man-caused global warming. Does that mean the we will get less atmospheric rivers and LESS extreme precipitation as the jet moves north? That should be true for someone along the coast. This is why the simple arguments often provided by the media (global warming means more extreme precipitation and floods!!) may not be quite true for everyone. And here is an interesting tidbit...the number of extreme flooding events have DECLINED in northern CA and southern Oregon during the past fifty years. Is it already happening? Are we next for a dry out? My profession really has to get a better understanding of all this. Thank You and Good article Warm, Wet, and Windy this time, hopefully can benefit for you all. see you in other article postings.